Shared medical appointments offer extra support and extended contact with physicians. North Shore Physicians Group (NSPG) offers shared medical appointments for patients diagnosed with particular conditions. This new model of healthcare is growing in popularity. Shared medical appointments typically involve six to ten patients who meet for 90 minutes at a time with their physician and a multidisciplinary team of medical providers. Each patient signs a confidentiality agreement, promising not to share information about other patients. Patients participating in shared medical appointments also receive an individual consultation with their physician where they can review medications or test results. At present, our North Shore internal medicine physicians offer shared medical appointments for patients with back pain or for those who would like the focus on general primary care or nutrition. Patients can see their doctor more frequently via shared medical appointments than with individual appointments. Patients in shared appointments spend more time with their medical professionals. A typical individual appointment may last 10 to 15 minutes while shared medical appointments may last up to an hour and a half. Patients get more education about their condition in shared medical appointments. 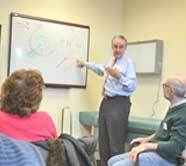 The doctor can take time to explain things in greater depth and patients also learn from one another. One patient may ask a question another patient would not have thought to ask, or one patient may speak about symptoms or developments that another patient has not yet experienced. Patients have a greater sense of community and a built-in support system. Most people who participate in shared medical appointments appreciate the opportunity to talk to others who are experiencing the same medical issues. Beyond shared medical appointments: other innovative forms of primary care through NSPG. In addition to shared medical appointments, our North Shore physicians offer other innovative approaches to primary care medicine. Concierge physicians offer a more personalized form of medical care by limiting the number of patients they accept. This gives patients faster access to the internal medicine group physicians at NSPG who offer concierge medicine. Use the Find a Doctor feature on our website to find internal medicine physicians as well as specialists like geriatric care doctors, family medicine specialists, or an OBGYN doctor.